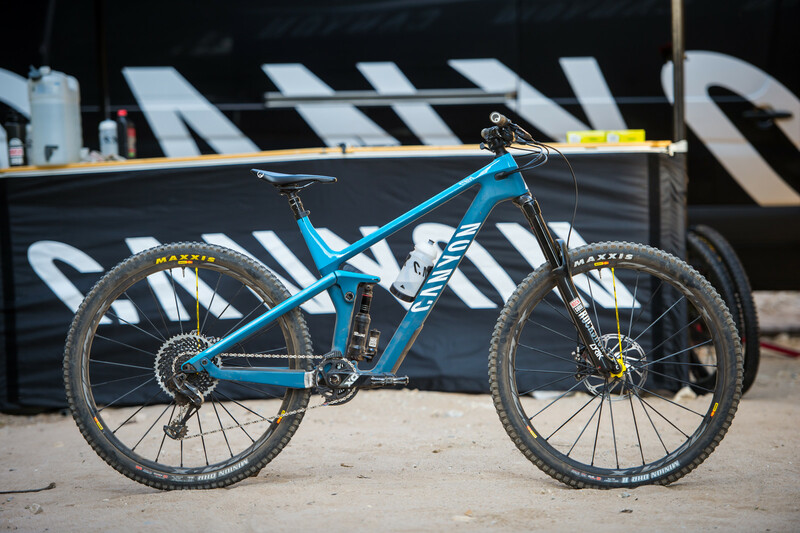 Canyon's EWS-winning race platform gets a major overhaul for 2019, with bigger wheels and a revised ShapeShifter headlining the changes. German direct-sales brand Canyon has enjoyed tremendous racing success over the past couple of years, with both their DH and enduro teams doing exceptionally well. In fact, the enduro team has finished the last two seasons at the very top of the EWS team rankings, and they’ve done so aboard the Strive. However, when it comes to racing, everybody knows you’re only as good as your last result, and what’s fresh today is old news tomorrow. With that in mind, Canyon set out to completely rethink their flagship enduro race platform, and the result is being unleashed on the world today. Canyon invited us out to Spain last week to ride the new bike – read on to find out what we thought of it. Canyon is pretty candid about who the Strive is for: racers and riders who like to go hard and fast. As such, when redesigning the Strive, they looked at how they could make the new bike as fast as possible but also fun to ride for those who get their thrills outside the tape. After much testing, they landed on 29-inch wheels as the optimal base to build from, citing the ability to carry speed but also the increased confidence the bigger hoops can bring as the main reasons. Note that Canyon doesn’t adhere to any particular “rules” or guidelines when it comes to picking a wheel size, rather they look at the bikes in each category as a whole and they try to build the best bike they can for each use case. That’s why there is no 27-inch option of this new Strive, for example, or why the new Spectral is 27-inch only. The next big item on the list of things to work on for the new bike was the ShapeShifter. 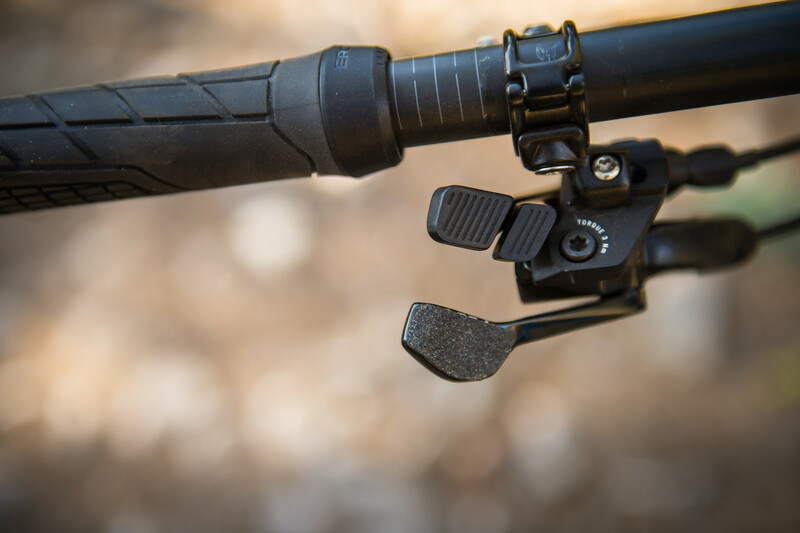 The ShapeShifter is Canyon’s take on providing an on-the-fly geometry adjustment feature, able to change shock travel, leverage ratio and key angles with just a simple lever on the handlebars. It achieves this by moving the shock pivot on the rocker arm via a piston-based system that can be locked in one of two positions, changing the leverage ratio and the rear wheel travel in the process. The previous generation of this system worked well enough, but it was a bit finicky to operate sometimes and it could be hard to know for sure if you had effectively managed to change modes (early versions also had some reliability issues but they were addressed with subsequent revisions). The new piston system (which was co-developed with FOX) is a different beast altogether, and although it achieves the same result it now operates in a different way when it comes to the user interface. In terms of the suspension system in general, the new bike gets a classic Horst-link layout just like the previous generation. 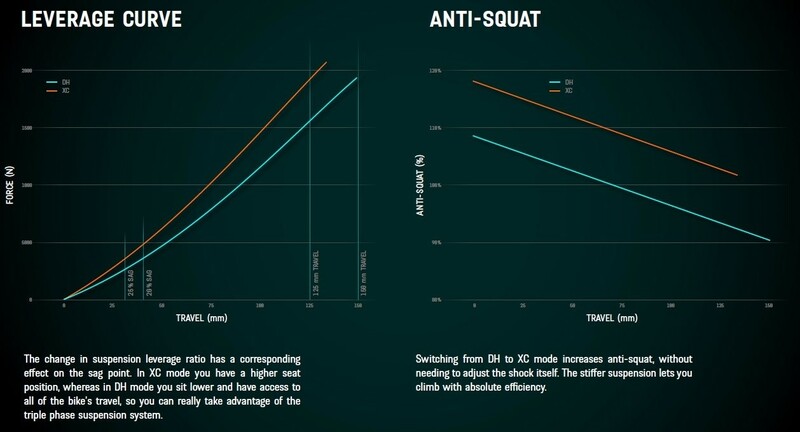 By changing the ratios and the relative positions of the suspension pivots, it provides a more progressive leverage ratio curve with a significant increase in anti-squat in XC mode. In “DH” mode, the new Strive features a 66-degree head angle and a 73.5-degree seat tube angle, which become 67.5 and 75 respectively in “XC” mode. The BB height also increases in XC mode. However, ShapeShifter doesn’t stop there. By changing the ratios and the relative positions of the suspension pivots, it provides a more progressive leverage ratio curve with a significant increase in anti-squat in XC mode. All of this adds up to a system that is able to transform the handling of the bike without resorting to locking out or otherwise adjusting the hydraulics of the shock; to provide a snappier and more efficient ride on flatter trails and climbs, with more relaxed angles and more travel available on the way back down. One of the issues with geo adjust features is that they often require an additional cable and lever on the handlebar. 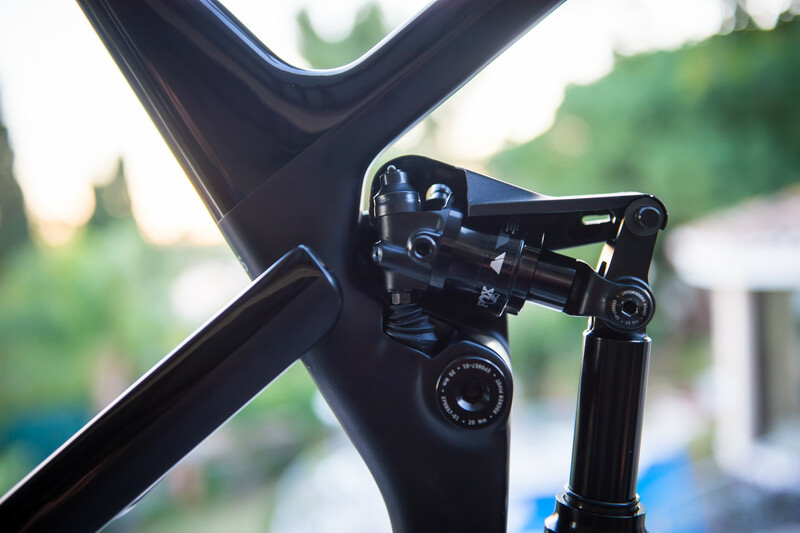 This is indeed the case with the new Strive as well, but the engineers at Canyon have come up with one of the best solutions we have seen to date regarding where to place the extra lever: the ShapeShifter and the dropper post levers can be “stacked” under the bar on the left-hand side. For mechanical dropper posts, Canyon provides its own lever which is able to deal with cable heads on either side (post side or remote side), while the RockShox Reverb 1x lever can also be “stacked” on the ShapeShifter remote. The result looks clean and works well - more on that later. Looking over the geometry of the new Strive in more detail, we find a bike that is bang on trend. With 4 sizes ranging from 415mm to 500mm in reach there should be something here for all but the most committed of super-long-bike lovers. At 435mm, the chain stays are relatively compact for a 29er, and there is also a short offset fork upfront. Canyon says the 66-degree head angle and short offset fork provide a stable ride at speed while the bike remains agile enough to deal with twistier trails as well. The seat tube lengths and stack heights remain fairly conservative. When it comes to frame construction, the new Strive features a number of smart solutions and nifty little tricks. Although the internal cable routing is not fully guided, the openings in the frame are large and the cable management system looks very clean. The rear axle features a clever little lever that slides into the axle for a slick look and less risk of hanging up. There is a bolt-on downtube protector and a chain slap guard that runs the full length of the chain stay, and space for a full-size water bottle inside the frame. Overall, the new Strive features very clean lines and an aggressive stance that makes its intentions known right off the bat. To conclude this overview section, note that there are now also two different carbon frame options: the regular “CR” frame and a new, lighter “CFR” option. The latter provides a weight saving of ~300 grams, thanks to a different carbon layup that requires less material – the CFR frame is used as the base for the “Team” and “LTD” builds. There are no alloy versions of the new Strive at this time (and no word on when or if there will be any in the future). To test the new Strive, Canyon whisked us away for an intensive day of riding in Malaga, Spain, aboard the CFR 9.0 Team edition which comes in at 5499 EUR and sits just below the range-topping LTD. As you would deduce from the name, the “Team” bike the closely resembles what the race team is on, with a smattering of high-end parts and an extra 10 mm of travel on the fork (170mm as ridden here). The trails around Malaga are steep, loose and rough so we were particularly happy to have a little extra firepower on tap. Setting up the bike is relatively straightforward, even with the extra complexity of the ShapeShifter. You set up sag and make all other adjustments with the bike in “DH” mode, then once your shock is set up for your weight you adjust the ShapeShifter pressure to about half of your shock pressure, and you’re good to go. You can fine tune how much rider weight transfer is required to activate the ShapeShifter when switching between modes by varying the pressure. Ergonomically, the new ShapeShifter is a big improvement over the previous generation. Moving out, the first thing we noticed was that the bike is easy to pedal around even before switching into XC mode. There is not a lot of pedal bob even with the bike in DH mode and the shock fully open, thanks to an anti-squat number that hovers around 100% already in DH mode. For mellower trails or when you need to get back up the hill, you switch the bike into XC mode which results in a steeper seat tube (and head tube) angle, and even more anti-squat. For us, the most significant effect of the ShapeShifter when it comes to climbing is the geometry, as the seat tube angle is pretty slack in DH mode which could leave many riders feeling like they’re “behind the pedals” a bit too much. With the ShapeShifter in XC mode, this feeling mostly goes away (although we would have liked to see the seat tube one degree steeper still). Ergonomically, the new ShapeShifter is a big improvement over the previous generation. Instead of holding down the lever and shifting your weight around at the same time to switch between modes, on the new generation you just lock or release the lever into the desired position, the system will then switch modes next time you transfer your weight accordingly. For example, to shift into XC mode you press the main ShapeShifter lever until it locks, and when you then unweight the bike a bit, the ShapeShifter piston extends and locks itself into XC mode. To revert back to DH mode, simply hit the smaller release lever, and pump the suspension to compress the ShapeShifter piston again. Having the lever co-habit with the dropper post like this is probably our preferred solution to date when it comes to managing multiple levers. We found this layout pretty intuitive even after just one day, and both levers are easy enough to reach in the heat of battle. One thing to note about the ShapeShifter is that it is not a lockout of any kind. It reduces the leverage ratio and shortens the rear wheel travel, but it achieves this without actually adjusting the shock itself. This leaves a bike with less travel and a more progressive leverage ratio curve in XC mode, which translates to a more dynamic and “poppy” ride, but without sacrificing traction or grip on more technical climbs. Because of the increased liveliness, the XC mode becomes a great tool for more mellow sections of trail as well, not just for climbs. If you really want to maximize the bike’s efficiency on long fireroad climbs, you can also lock out the shock itself (although the upside down position of the shock does make this a bit tricky to do on the fly as it tucks the shock lever in behind the chainring, but there is internal cable routing available should anyone wish to run a remote lockout shock). Pointing the new Strive down the hill, we found the new bike easy to get along with. Starting from the recommended settings, we ended up adding a bit more air to the fork, while we got our best results with about 28% sag out back (Canyon recommends anywhere between 25-30%). This left us with a comfortable set-up that had more than enough in the tank to deal with anything we could throw at it. The rear suspension offers a good mix of support and sensitivity, and more than enough progressivity to deal with bigger features as well. If anything, it might have been interesting to bump the rear travel to 160mm to make the bike even more of a monster truck, especially given that the ShapeShifter is there to shorten the travel when needed, but we can’t say that the 150mm held us back. In fact, we could also congratulate Canyon for sticking to their guns here and delivering a bike that meets the design brief for an enduro race bike as opposed to getting tempted into adding more travel (they do have the Torque in the line-up, for those riders who spend more time freeriding and/or in bike parks). It’s big and burly enough to take on anything from long and rough enduro stages to runs in the bike park, yet it pedals well enough to be able to also tackle long days out in the saddle with lots of climbing. We tested both a size L and XL at this launch, and this 1m84 / 6’0” tester ended preferring the XL for the fast and rough trails of Malaga. The geometry is aggressive without being over the top, and the big wheels were a welcome feature when it came to monster trucking the chunk (which is par for the course in this area). We can’t say that we were able to pinpoint the effects of the shorter fork offset (coupled with a short, 40mm stem), but the overall impression is of a very stable bike that is easy enough to stick into turns, once you adjust your timing a little bit. So, who is the new Strive for? That’s a pretty easy question, because the answer is that there isn’t much the new Strive can’t do. It’s big and burly enough to take on anything from long and rough enduro stages to runs in the bike park, yet it pedals well enough to be able to also tackle long days out in the saddle with lots of climbing. The ShapeShifter is an interesting solution to the one-bike-quiver problem, especially when it comes to tackling less technical and steep trails that can otherwise become a bit boring on a big bike. The only caveat at this time is that there is no alloy version of the new Strive in the range (and no news on whether or when one might be coming). That means that the lowest price point to get into the new Strive club at the moment is 2999 EUR, which is still great value for a carbon bike but nevertheless narrows the market somewhat. Our test bike featured a Lyrik with the old damper, and it also had just one token installed which left it fairly linear (we ended up adding a bit of air to compensate). The production bike gets the 2019 version with a Charger 2 damper which is an impressive fork to say the least. Supple and smooth off the top with good mid stroke support, it provides great small-bump sensitivity and tons of control on bigger hits. The Super Deluxe RCT out back is also one of our favorite rear shocks, and it proved up to the task at hand on the new Strive as well (even though it has its work cut out for it with “just” 150mm of rear wheel travel on tap). SRAM’s Code RSC are among our favorite brakes, and with good reason. Tons of power and tons of modulation, they really are everything you could ask for in a brake built for big bikes. Mavic supplies the wheels on the CFR 9.0 Team, the Deemax Pro paired up with Maxxis DHR2 tires. We like how the wheels performed on the trail, with quick engagement and snappy handling, but we did note quite a few punctures throughout the day (the very rocky ground and rough trails had their part to play in this for sure). The relatively narrow inner width of the rims may be partly to blame. The SRAM Eagle X01 transmission worked well during this test, much as we are accustomed to. With a 32T chainring up front, we had all the range we needed to take on the challenges of the day, including a fairly grueling 25-minute climb up a steep fire road. Canyon’s own G5 cockpit and Ergon grips and saddle round out the CFR 9.0 Team build. Contact points are always a personal thing, but we got along well with Canyon’s choices here. For more information on the new Strive, head on over to www.canyon.com. Johan loves bikes, which strangely doesn’t make him any better at riding them. After many years spent practicing falling off cliffs with his snowboard, he took up mountain biking in 2005. Ever since, he’s mostly been riding bikes with too much suspension travel to cover up his many flaws as a rider. His 190-pound body weight coupled with unique skill for poor line choice and clumsy landings make him an expert on durability - if parts survive Johan, they’re pretty much okay for anybody. Johan rides flat pedals with a riding style that he describes as "none" (when in actuality he rips!). Having found most trail features to be not to his liking, Johan uses much of his spare time building his own. Johan’s other accomplishments include surviving this far and helping keep the Vital Media Machine’s stoke dial firmly on 11. I knew the new Strive was gonna be a 29er given the Torque and the longer legged Spectral! It makes sense since Trek did exactly the same with the Remedy and Slash. Hi Iceman, it seem like a direct competitor to the jeffsy (at least the pro race version). You seem to have ridden both, how would you compare them ? I would place the Strive more in between the Jeffsy and the Capra, as opposed to just a straight up Jeffsy competitor (that would be the Spectral). But yes, the bikes are not that far apart, especially since I rode the Pro Race version of the Jeffsy 29 which has 150mm of travel front and rear (up from 140 for the other versions). It's hard to offer a direct comparison, mainly because I rode the bikes in two very different locations: the trails in Malaga were a lot rougher and way more sketchy, whereas the trails where I rode the Jeffsy were a bit smoother and less loose. With that in mind, it's probably fair to say that the extra fork travel of the Strive pushes it into the realm of a "real" enduro bike, whereas the Jeffsy is more of an all-mountain bike that punches above its weight. The real differentiator is the ShapeShifter on the Strive which really does add another dimension to the riding experience on less demanding trails.